Buzz Aldrin’s Race Into Space (or BARIS, as it is affectionately known) is an odd beast. 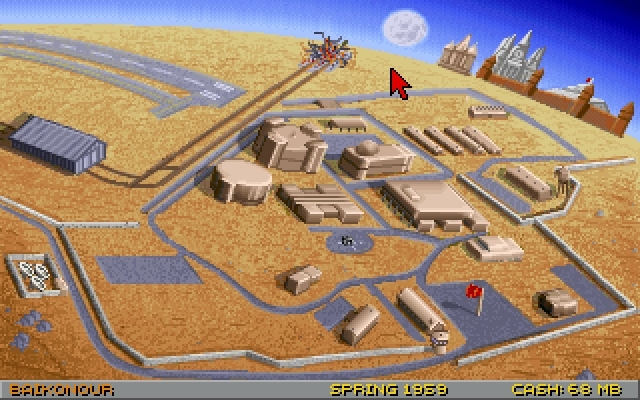 It’s a computer adaptation of a boardgame called Liftoff!, and since the designer of the boardgame was in charge of the computer version it hews pretty closely to the boardgame rules. This means that BARIS is somewhat more abstracted than you might expect a computer game to be, but at the same time given the game’s roots it’s quite astonishing just how much detail they did manage to cram in here. A lot of boardgames come up with a core gameplay mechanic and then find a theme to fit to it, and this can end up producing a completely nonsensical disconnect as with Dominion. Not Liftoff, though, In Liftoff the rules and gameplay fit the theme – the technological duel for the stars between the USA and the Soviet Union during the late 50s and 60s – and it very definitely shows in BARIS. As a result I would probably nominate BARIS as one of the most educational video games in existence. It doesn’t have the broad sweep of knowledge that a game like Civilization imparts to the player, instead being fearsomely specialised in its particular subject area, but I guarantee you that when you get done playing a game of BARIS you will have a better grasp of how the R&D of new spacecraft worked during the space race than 99% of the population of planet Earth, being as it is woven into the very fabric of the game itself. BARIS casts you as the director of either the US or Soviet space programs. The game starts in 1957 – so just about pre-Sputnik – and you have almost complete control over what you do: buying new rockets, investing in R&D for capsules, training astronauts, scheduling missions and so on. There are two turns per year, and the game ends in 1977 (or when somebody lands on the Moon) so you have, at most, forty turns to achieve your goals. You get a budget to spend every year, the size of which depends on your prior achievements and the accumulated prestige accrued by your efforts to slip the surly bonds of Earth. There’s a fair amount of simplification in BARIS. The types of rocket and capsule available to the US and USSR are functionally identical, being different in name only. There are no dollars or roubles in this game, only pretend money called “megabucks”. As befits its boardgame roots the two sides are almost perfectly symmetric, which at least ensures a level playing field even if it does cause the game to lose some of its flavour. But don’t let BARIS trick you into thinking that this abstraction and simplification means you’re playing a simple game. You’re really not, and if you want to see proof that you’re not all you have to do is go to the administration building and click the Future Missions tab. Here you will be presented with a staggering range of sixty-odd possible missions you can fly, ranging all the way from simple orbital satellites to full-blown lunar landings. The level of detail here is staggering; you can do planet flyblys, lunar recon, probe landings, choose between Earth Orbit Rendezvous and Lunar Orbit Rendezvous for your lunar landings, or even make a crazy direct ascent to the moon. 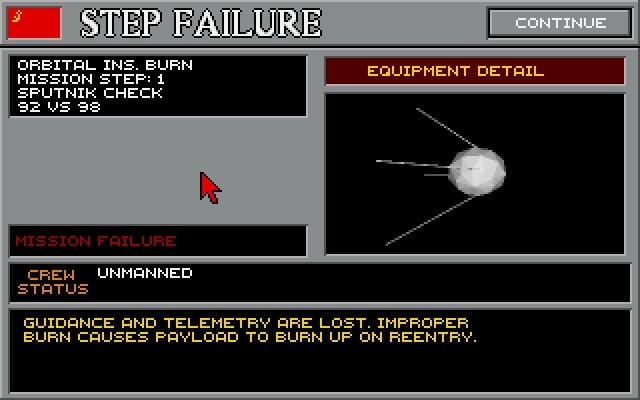 Having this number of options available for your first space mission would be overwhelming if there wasn’t some sort of progression involved, and in BARIS this progression comes in the form of the spacecraft safety factor. When you pay the lump sum to start a rocket, capsule or equipment program, you end up with one example of the item in question which has a safety factor of zero. 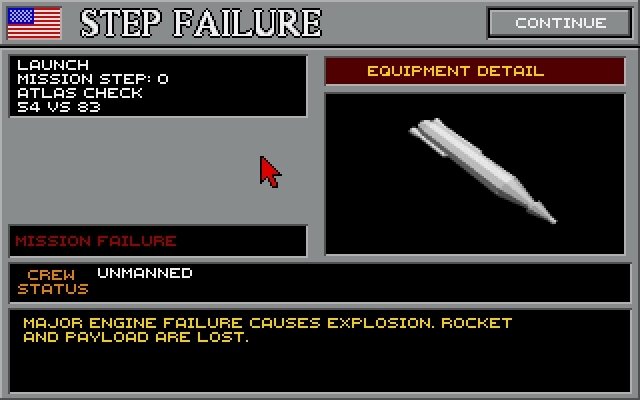 That is, if you try to launch it into space immediately, it is guaranteed to blow up on the launch pad. This is not exactly what you want out of a space vehicle, so before the spacecraft makes its first flight you have to invest a significant amount of money into research and development which improves the spacecraft’s safety factor. There are two catches here, though. 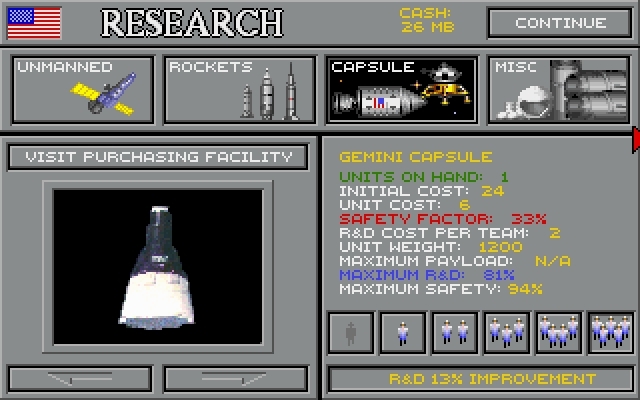 One is that you can only invest so much in R&D for each program in a turn, so you’re not going to get your Mercury capsule up to 100% reliability in a single year. The other is that there’s a hard ceiling on the safety factor achieveable through R&D alone, which is typically somewhere between 75-85%. This reflects the fact that at some point you actually have to test your theoretical spacecraft design in an actual spaceflight and make any further improvements as a result of those test flights. Every spaceflight is made up of a series of stages – launch, orbital insertion burn, re-entry and so on – and every stage makes a safety check for the associated piece of equipment. If the rocket passes the launch check, everything goes smoothly. If the rocket fails the launch check, it can blow up just minutes after liftoff, or even explode on the launch pad necessitating a costly rebuild. As spaceflights get more complex, with manned orbital flights and EVAs and trips around the moon, more and more safety checks are introduced which means your flight has more and more potential points of failure. 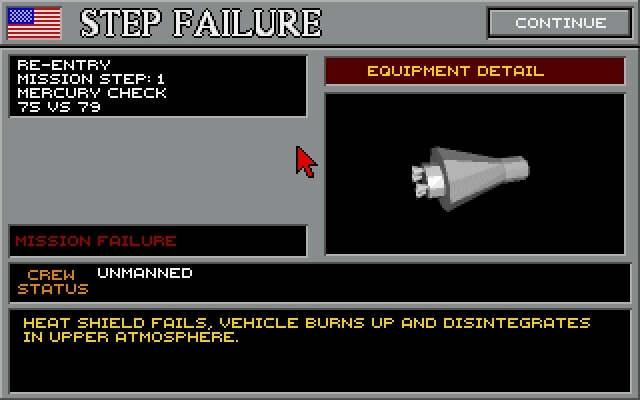 And to cap it all off, trying to launch an advanced spaceflight mission without doing the intermediate “steps” leading up to it (i.e. going straight to manned orbital flights without doing sub-orbitals first) will incur a safety penalty depending on how many of those steps you skipped. For the effect this has on the game, look at this summary of a historical lunar flight. 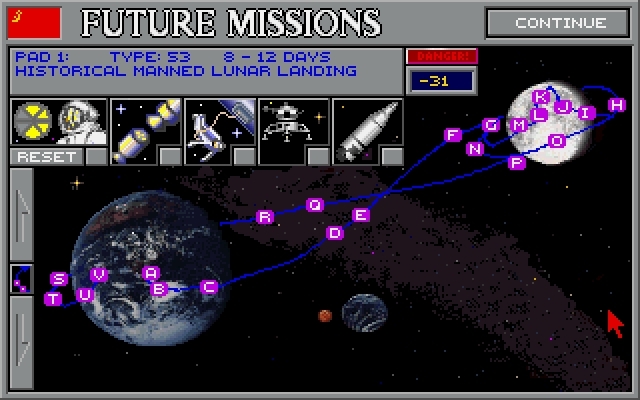 Every letter on the spacecraft trajectory represents a check of one or more pieces of equipment that has to be made, with the consequences for failure ranging from the trivial (the astronaut trips and falls while descending the lunar module ladder) to the catastrophic (total loss of crew and spacecraft). The number in the red-headlined box is the penalty that will be incurred on every single one of those checks for trying to do a moon landing without building up the necessary experience and expertise first. As you can imagine, this makes you highly unlikely to succeed with a lunar landing straight off the bat. You have to take it slowly and carefully in order to have a reasonable chance of eventual success. 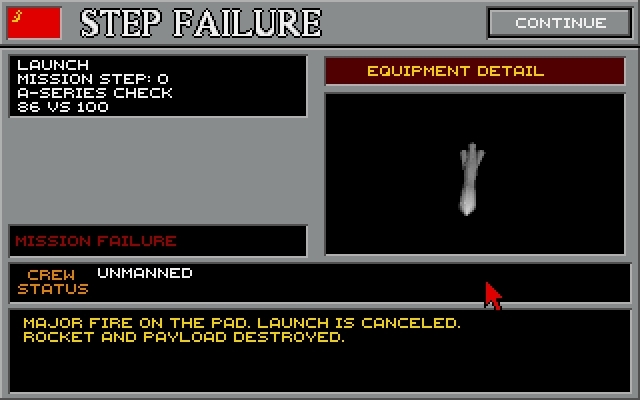 The good news is that for every flight where a piece of equipment successfully passes a safety check, the overall safety factor for that equipment is increased by 1%, making (for example) spamming unmanned Mercury launches to build up the safety factor the best strategy if you eventually want to stick a man in there and bring him back alive. Or it would be, if there weren’t the small matter of your opponent in the space race trying to do everything before you. Every space first in the game – first satellite, first man in space, first woman in space, first probe to another planet – will reward whoever achieves it with a hefty prestige bonus, increasing both their funding and their overall score. Getting there second will award a much smaller prestige bonus, and could even end up getting you nothing at all, which means dragging your feet too much could have potentially fatal consequences for your space program. And of course, if your opponent ends up on the Moon before you do it’s game over. This makes BARIS a constant balancing act between carrying out flights safely and pushing the space program forward quickly. You can’t do both, so you have to decide what risks are worth taking in order to beat those dirty communists/perfidious capitalists to the Moon. 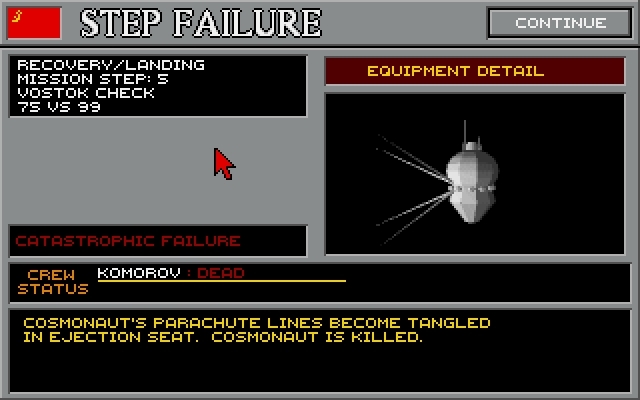 This is the part of the game that really encapsulates the real-life space race; both the Soviet and US space programs had their share of space disasters and astronaut fatalities as direct consequence of moving too fast and cutting too many corners in order to achieve political goals. For me it really gets across the iterative nature of the capsule programs and the progression from Mercury to Gemini to Apollo, as well as teaching me not a few things I didn’t know about the various types of space mission that were undertaken during the space race. It all comes together to make BARIS a fantastic game that educates you about that period of history to boot without you even noticing it, but be warned: it is also notoriously difficult. 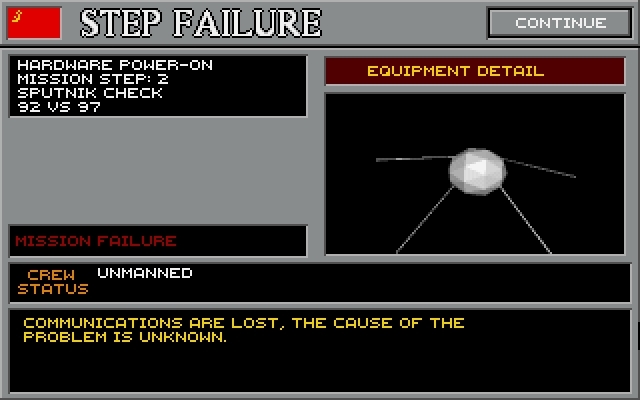 There’s a vast, vast number of failure scenarios in the game, and you will become intimately familiar with all of them before you successfully land men (or women) on the moon. As far as I’m concerned, though, that’s part of the game’s charm. As Kennedy said, it wouldn’t be worth doing if it was easy, now, would it? 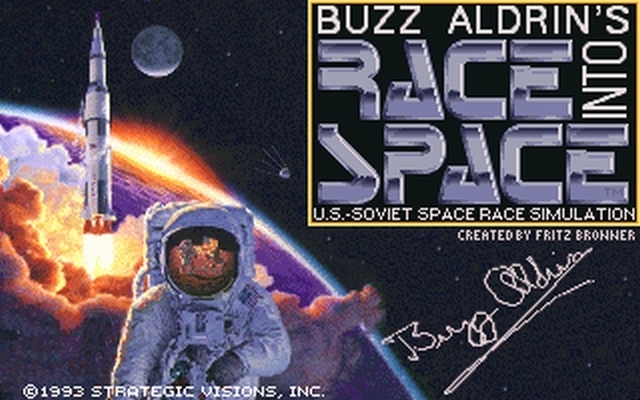 You can get Buzz Aldrin’s Race Into Space from Abandonia or your nearest abandonware equivalent. Downloading the manual and the patch is also highly recommended, as is Dosbox to make it run if you don’t already have that.